Samsung launches Galaxy A80, a smartphone with a unique Sliding & Rotating camera at an event held in Thailand. It comes with a new 6.7-inch Full HD+ Infinity-U Super AMOLED display with an aspect ratio of 20:9 and powered by the Snapdragon 730G Mobile Platform with 3,700mAH battery that supports 25W Fast Charging. It offers 8GB RAM, 128GB internal storage and boots on Android 9.0 Pie with Samsung One UI. The key highlight of the Galaxy A80 is the Rotating triple camera setup. When users select the camera app, the three cameras automatically pop-up from the back of the phone and also rotates when the selfie mode is selected. The rotating camera setup includes a primary 48MP f/2.0 primary sensor, an Ultra Wide 8MP sensor and a 3D Depth sensor. Check out the key features below. 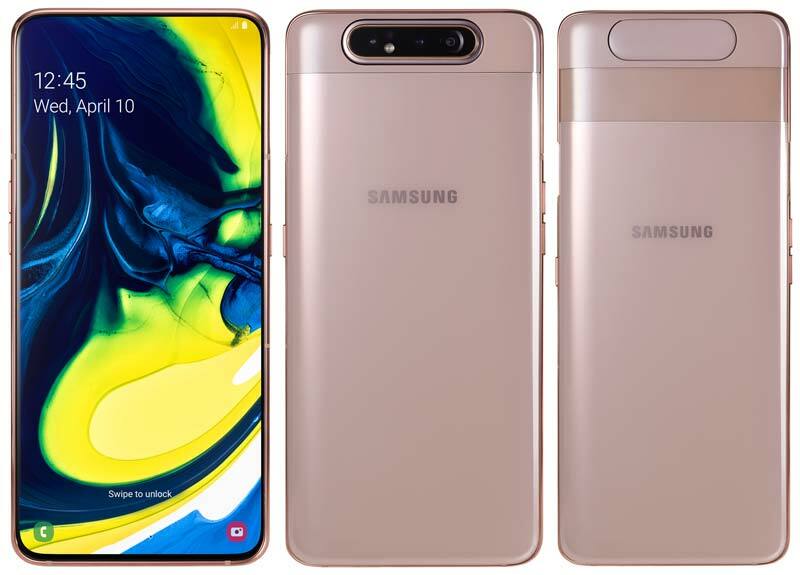 The Samsung Galaxy A80 comes in three colors – Angel Gold, Ghost White, and Phantom Black and expected to go on sale in several countries including India in May 2019. There is no official wording about the pricing.